Inaugural iStepUp Program – What you missed! » Impact! « I-Step Up Summer School! The IMPACT Step Up (I-Step Up) Program ran from Monday August 1, 2011 to August 6, 2011 at the Bridge House College, with an average daily attendance of 40 participants, who were primarily senior secondary school students, jambites, and university undergraduates. 40% of these participants were female. Students came from a variety of schools, including: American International School, Babcock University, Fountain Heights, Houdegbe North American University, Kings College, LASU, Loyola Jesuit College, Nigerian Turkish International College, Trinity College and UNILAG. Folabi Esan, Founding Partner, Adlevo Capital – What do you want to be when you grow up? The rest of each morning consisted of quantitative and verbal skills classes delivered by B2Consulting. The afternoons were filled with career and personal development talks and panels. How to Pick a Career was a panel focused on exploring lessons learned by panelists – management consultant, Gbolahan Fagbure, and entrepreneurs, Edward Odejobi and Kofi Afaedor, in charting their career paths. They shared their pearls of wisdom on how they made key academic and career choices. Demystifying Success was a panel exploring popular vs. alternative career options and de-mystifying the misconception that success has a singular conventional path. IMPACT brought panellists from a variety of professional backgrounds – Linda Bembatoum, Senior Program Advisor at Pro-Natura International, Dayo Osholowu, a sports physician, Kola Oyeneyin, Executive Director of Venia Consulting, and Tokini Peterside, Communiations & Events Manager at Moet Hennessy. Maximizing your Experiences to Compete in Today’s Marketplace was a panel that focused on the importance of academic and career planning for students to achieve their goals and to gain entry to top tertiary and professional institutions. Panelists – Bowale Odumade and Orinola Gbadebo-Smith – engaged participants on the importance of networking, mentorship, internships, etc. for preparing students to compete in today’s job market. Seeing the Bigger Picture was a panel focused on the critical importance of seeing the ‘big picture’ in whatever you do – having a vision and communicating that vision, thinking beyond individual success to community success and how to make an impact in the world. This panel consisted of change agents Bunmi Otegbade, Charles Bassey-Eyo and Chinwe Odigboegwu. 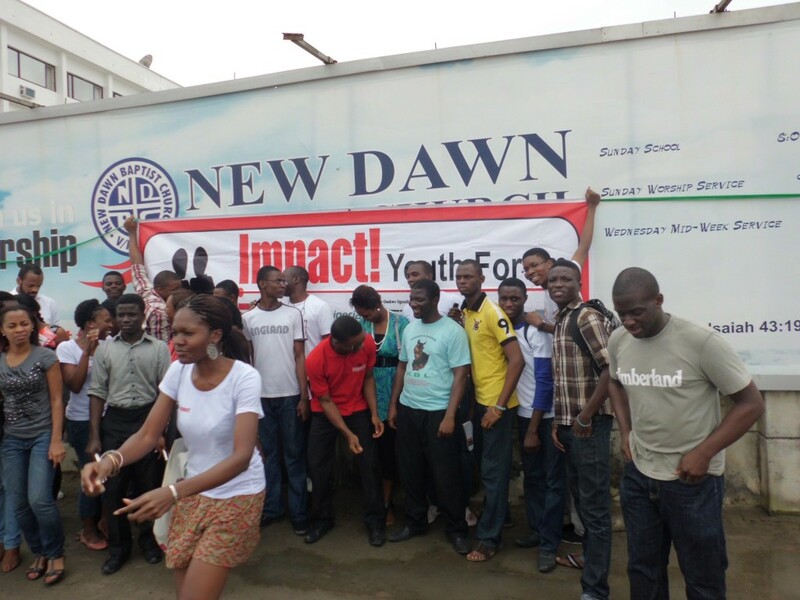 On Saturday August 6, 2011, the students assembled at the New Dawn Baptist Church on Water Corporation Drive (Oniru) for a day of Community Service, in which participants and IMPACT volunteers organized a Soup kitchen event to feed the local community lunch. In all, 10 cartons of indomie were cooked, 300 eggs boiled, and over 350 packs of food were distributed. It was not only a great way for participants to learn in practice the importance of making an impact on your community, but also a chance for them to interact with each other and the IMPACT team in a fun (albeit rainy) setting. Thank you to the church for letting us use their premises and for all their support. Thanks also to Cloud 9 Food Team for their generous sponsorship. 2 academic scholarships of N50,000 were awarded to Patrick Edem (Best Attitude) and Pamela Uju Morgan (Most Improved Student over the course of the program). We also thank all our dedicated speakers and panelists. Thank you for inspiring minds.